This page remains here for archival reasons. As of March 12th 2015, the last of the servers accepting sign-ins from Adium have gone offline. To use the Messenger service on the Mac, you will need to use Skype, the web-based Outlook.com client, or Windows Live Messenger 2012 in a Windows virtual machine. As there’s been some requests for this, I put together a simple dmg which lets you copy the newly patched libpurple to the correct Adium (/Applications/Adium.app/Contents/Frameworks/libpurple.framework/Versions/Current) folder. Hopefully Adium is updated soon so this won’t be needed. Update: In addition to the above, due to changes on the Messenger servers, you will now need to make a small adjustment to make Adium work. Choose the Adium menu, choose Preferences, double-click the MSN account, choose the Options category and change the Login Server to be msn.messengergeek.com and click OK. This should be included in a future Adium Reviver version. The post, Most third-party Messenger clients have gone offline temporarily has more info about the change made. Additionally, you can also revive the official Messenger:mac client. If you receive a message that the “libpurple folder” requires an administrator password, you probably don’t have Adium or the right version of Adium installed. On some accounts you might not be able to see your full contact list, this should soon be resolved in other clients and hopefully fixed in Adium too. This page remains here for archival reasons. As of March 12th 2015, the last of the servers accepting sign-ins from Messenger:Mac have gone offline. 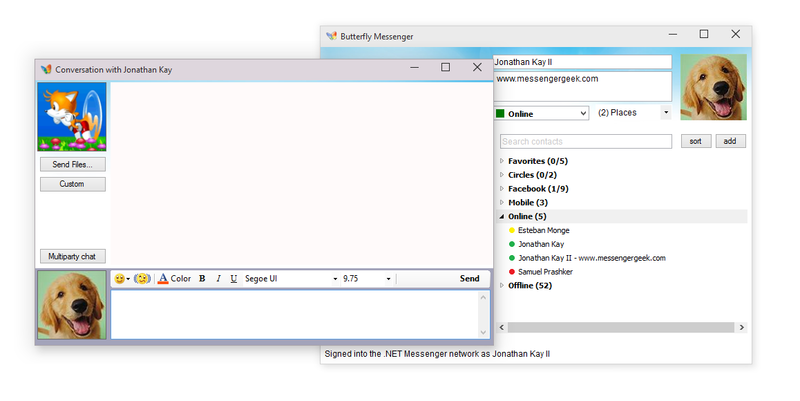 To use the Messenger service on the Mac, you will need to use Skype, the web-based Outlook.com client, or Windows Live Messenger 2012 in a Windows virtual machine. Sign in to Microsoft Messenger failed because the service is not responding. The service is not available or you may not be connected to the Internet. As the underlying problem is similar to the issues from earlier this week, using the same technique used by the third-party clients and for Windows Live Messenger 2009, we can revive Messenger:mac. To revive Messenger:mac, download the Messenger Reviver 2 dmg and open it from the Downloads folder. Then right-click on the Messenger Reviver 2 mac icon and choose Open. If you receive the “unidentified developer” warning message choose Open when asked. Next, you may get a message reminding you that you’re about to install software, click Continue. You can then click Continue to the Introduction screen, then the Install button, type in your password, and finally click the Install Software button. After Reviver has completed, Messenger:mac should re-open and you should be able to sign in. Important note: Unlike the Windows version, Messenger Reviver 2:mac at this time is not able to automatically download and install Messenger:mac. If you do not already have it installed, you can install it from c|net Download.com. When you sign into Messenger:mac after using Reviver:mac, you most likely will see various contact list addition requests from your contact list. This is a side effect of tricking the server, and can either be ignored or dismissed. Unfortunately, they will return again when you sign in again. This issue is being seen in various third party clients as well. In addition to this, even though contacts appear on your contact list, you might receive a message “Do you want to accept a message from an unknown sender”. Click the Accept button and you can proceed with the conversation. Lastly, on some accounts you might not appear online to your contacts. Regrettably, this is a result of the same issues above. You can workaround this problem by signing in on another client first (including logging into your Microsoft account at Outlook.com) and then signing into Messenger:mac. The other client will put you online and Messenger:mac will take over your Messenger session. Yesterday Microsoft released Windows Essentials 2012 which among other things, removes Windows Live Mesh for SkyDrive (which is barely a comparable product). But unlike the 2011 and 2009 versions of the Essentials, thankfully you can actually install Live Mesh on your existing 2012 installation. To make this easy, I’ve written a small tool called Live Mesh Installer. To get started, download the Live Mesh Installer, choose Run if possible or download and open the zip file yourself. Next, just run the LiveMeshInstaller.exe inside the zip file and choose Yes when prompted for administrator rights. Finally choose the language version you prefer from the list and then select the Begin button. The Installer will then download the Windows Live Essentials 2011 web installer and automatically install Windows Live Mesh. Please note that installation will take some time as it will need to download, extract and install Live Mesh. When it is complete, Live Mesh will start automatically. If you prefer to see what’s happening with the installation, uncheck the ‘Hide installation wizard’ option before you begin. When the Windows Live Essentials setup begins, you will be prompted to either install all the products or choose the ones you prefer. Only Live Mesh will be installed on either option (unless you choose others specifically in the choose screen). Unfortunately as Windows Essentials 2012 is hardcoded to remove Live Mesh, any upgrades or changes you make to your Windows Essentials 2012 installation will result in Live Mesh being removed again. If this happens, just re-run the tool and install it again. Hopefully this won’t happen too often. UPDATE (4/23/2013): Use Messenger Reviver 2 instead to bypass the forced upgrade to Skype. Microsoft today started forcing upgrades to Windows Live Messenger 2011 on Windows 7. Unfortunately the 2011 version drops several key features, adds several annoying features, and is not that impressive of an upgrade. Certainly many just prefer to use Live Messenger 2009 and now you can (again). A newer version is available. You must install the newer version in order to continue. Would you like to do this now? A newer version has been downloaded and is available. You must install this newer version in order to continue. Would you like to do this now? To bypass the forced upgrade for Windows Live Messenger 2009, download my Messenger Reviver utility below, open the MessengerReviver.exe file contained within the zip file and click Start. Messenger should automatically exit and then restart normally. You should then be allowed to sign in again. Note that Messenger Reviver requires administrative rights and you will be prompted to authorize if you have UAC engaged. Does it work with other modifications to Messenger? Yes, Messenger Reviver will not remove any changes you’ve made to Messenger. However, if you use such a tool later, you may need to re-run the reviver afterwards. I am receiving a “Updating Messenger failed” message, how can I fix this? After the Windows Installer completes its work, try using Messenger Reviver again. If you encounter additional problems or don’t like the idea of someone else tweaking with Messenger, another solution to getting signed in again is setting the Windows Live Messenger shortcut into Windows XP compatibility mode. To do this, locate the Windows Live Messenger shortcut on the start menu, right-click the shortcut, choose Properties, then choose the Compatibility tab, choose Windows XP (Service Pack 3) and then click OK. If Messenger is already running, restart it and you should now be able to sign in. Unfortunately by using this compatibility solution, Messenger will change its behaviour as it would operate under Windows XP (for example, a notification area icon with status instead of in the taskbar, and so on). Additionally, some features in Messenger may not work properly since it assumes you’re on Windows XP (for example, Remote Assistance). Messenger Reviver does not have these limitations and I don’t personally recommend using the compatibility technique if you don’t have to.